The purpose of the Falmouth Corner Preschool is to provide enrichment of the preschool child's physical, emotional, social and intellectual growth guided by professional teachers and actively assisted by participating parents. Click below for our enrollment application! Providing enrichment of the preschool child's physical, emotional, social and intellectual growth. Now located at 190 Middle Road in Falmouth! 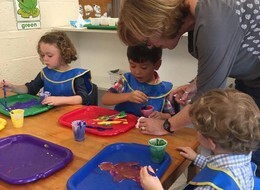 Falmouth Corner Preschool offers a multi-aged program for children 3 to 5 years of age. Children meet Tuesday, Wednesday and Thursday from 8:30AM to 12:00PM. The program runs from September to June. The 4+ program is dedicated to preparing children 4-5 years old for kindergarten. This program runs on Mondays from 8:30AM- 12:00pm. An understanding of self and others. Two professional lead teachers, both with experience and training in early childhood education. An opportunity for parents to be part of their child's education both in and out of the classroom. 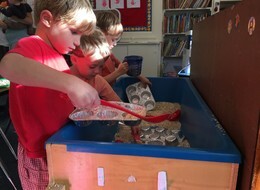 The unique opportunity for each child to develop at his or her own pace in an environment where creativity, discovery and independence are encouraged. An exceptional student:adult ratio (approximately 5:1).